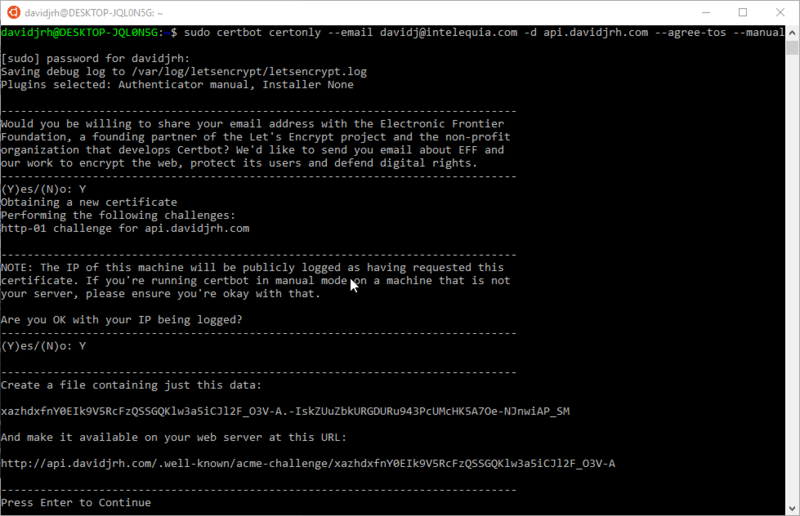 Many websites and services are already using it worldwide. 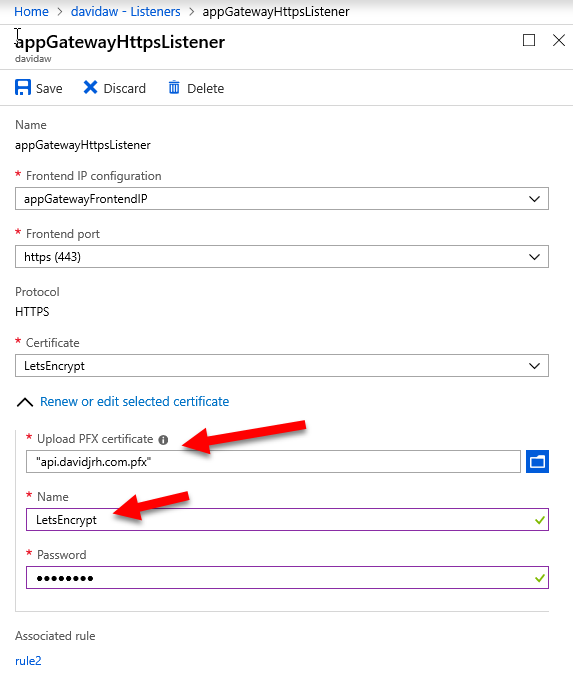 If you can get SSL certificates issued by a well-known CA for free, there is no excuse to use HTTPS on your website and be secure by default. 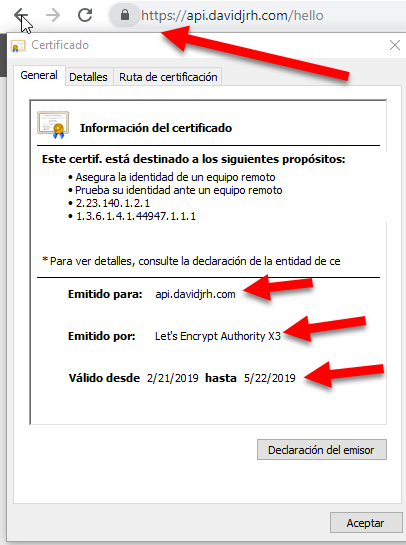 The process of issuing a Let’s Encrypt certificate can be automated by using a piece of software that uses the ACME protocol, which typically runs on your web host. 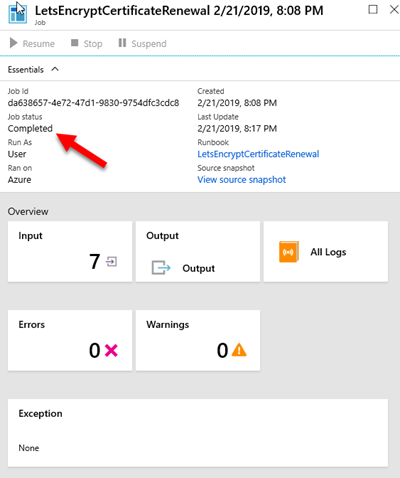 These certificates normally expire in no longer than 3 months (something that increases the security of the system), so you need to automate the renewals to avoid the manual renewals. A good example of this implementation is the Azure App Service Let’s Encrypt extension, that automates the renewals by using a webjob. You can read more about it at this Scott Hanselman’s blog post. 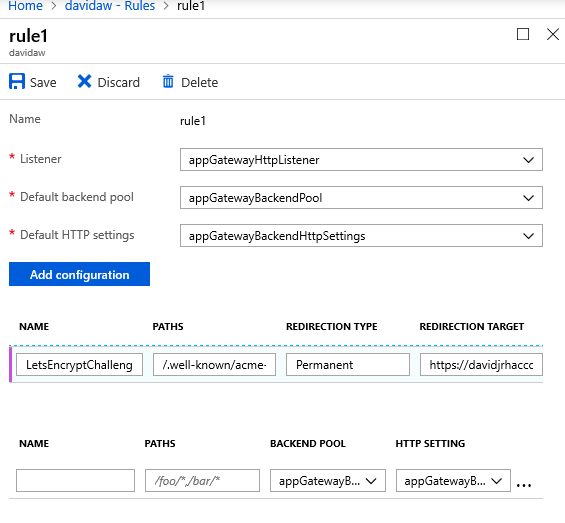 When using an Azure Application Gateway, one of the things you need to do is to install the SSL certificate on the gateway. You probably want to implement SSL offloading, so all the resources needed to secure the communication channel is handled by the gateway and not by the servers behind. On this post I’m going to explain just this scenario, showing how you can automate the Let’s Encrypt SSL renewals on an Azure Application Gateway. Special mention to Ricardo León from Intelequia, who worked on the implementation shown below. 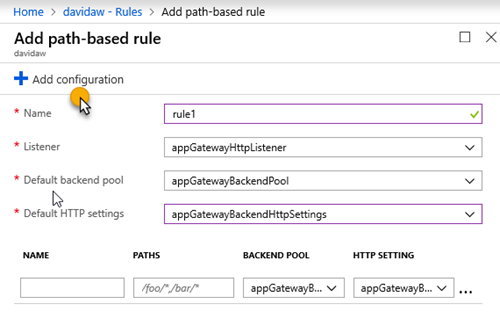 Note that with this implementation, there is no need to manipulate any other infrastructure behind the Application Gateway. 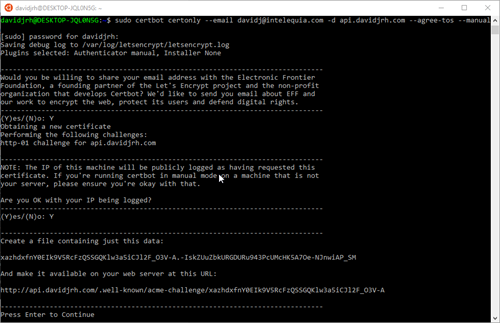 I wanted to issue and automate the renewals of Let’s Encrypt certificates for “api.davidjrh.com”. Note that I had already a DNS record of Type A targeting my Application Gateway. 1. 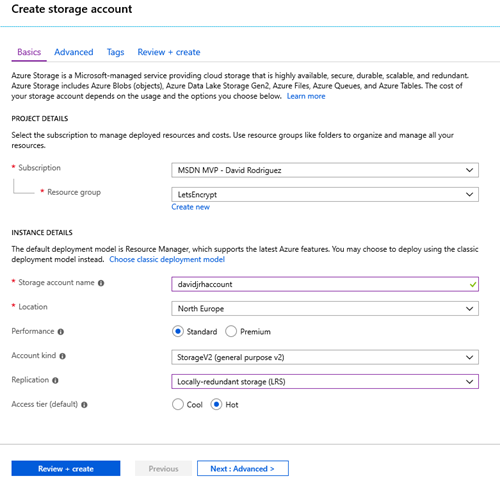 Create an Azure Storage account that will be used to host the challenge requests for the DNS domain ownership check. 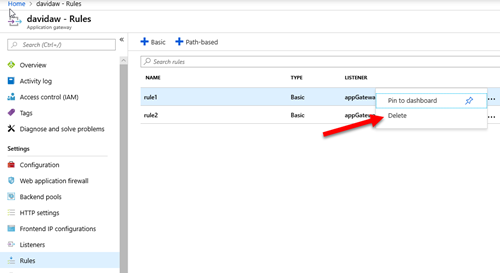 Use the cheapest parameters such as “Standard performance” and LRS. 3. 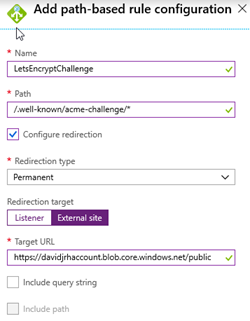 Create the virtual directory “\.well-known\acme-challenge” using the Storage Explorer tool. 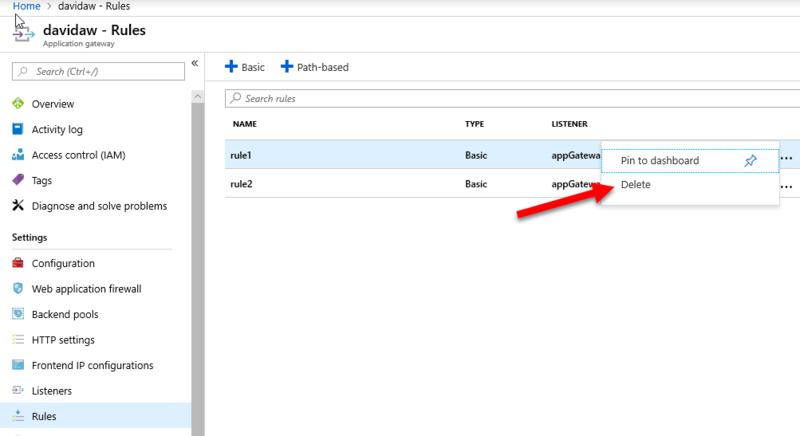 If everything was setup correctly, when browsing the URL, the application gateway should redirect your browser to the storage account as shown below. Don’t continue until you have successfully setup the redirection rule. To install the Let’s Encrypt certificate on the gateway the first time, you have to issue it first. 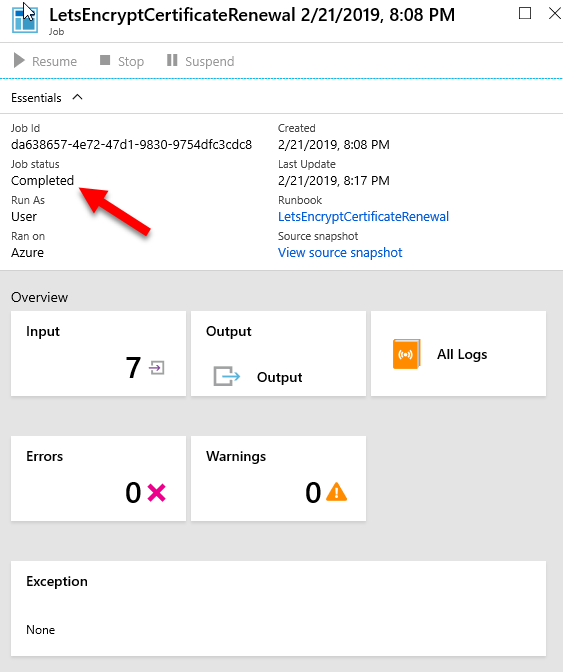 There are several ways to issue the certificate, but the easiest one is to use Certbot, a tool available on GitHub and built on Python that allows you to obtain certs from Let’s Encrypt. There are other clients, so you can probably share better ideas on the comments area of this post. 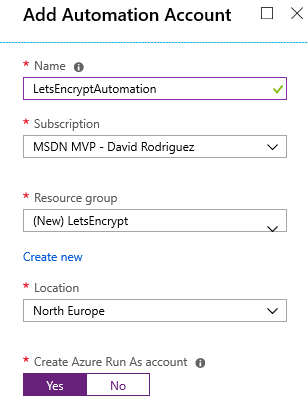 Now that the LetsEncrypt certificate is installed and working properly, the next step is to automate the renewals. 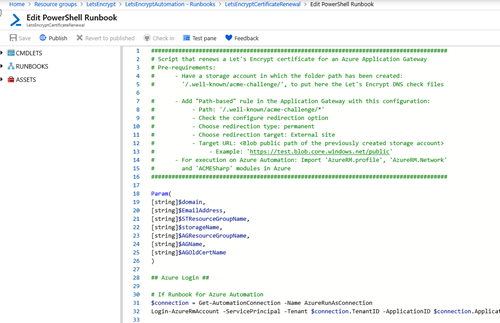 Let’s do it with an Azure Automation runbook. 1. 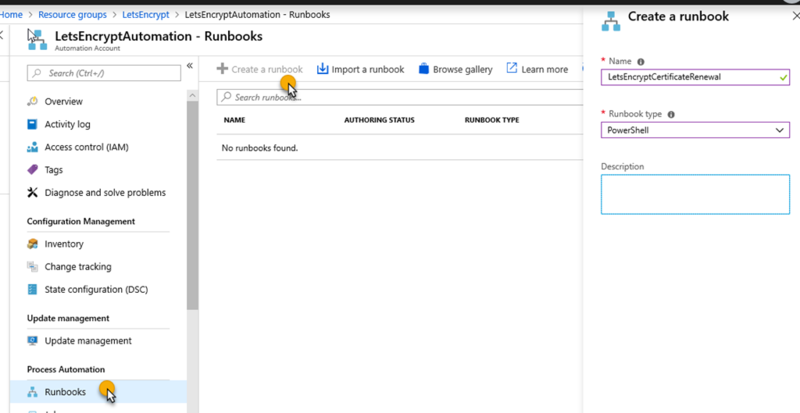 On the Azure Portal, create an Azure Automation account (or use an existing one) to host the runbook. 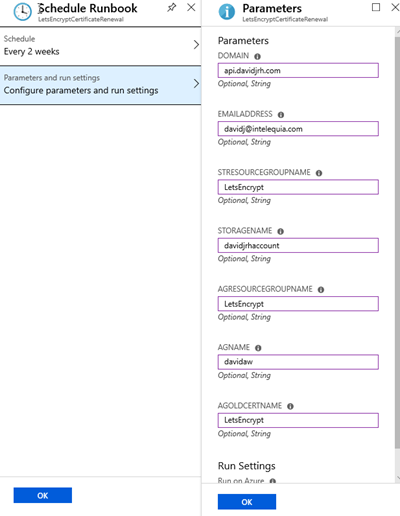 Note that you can create this automation account and run up to 500 minutes per month for free. 2. 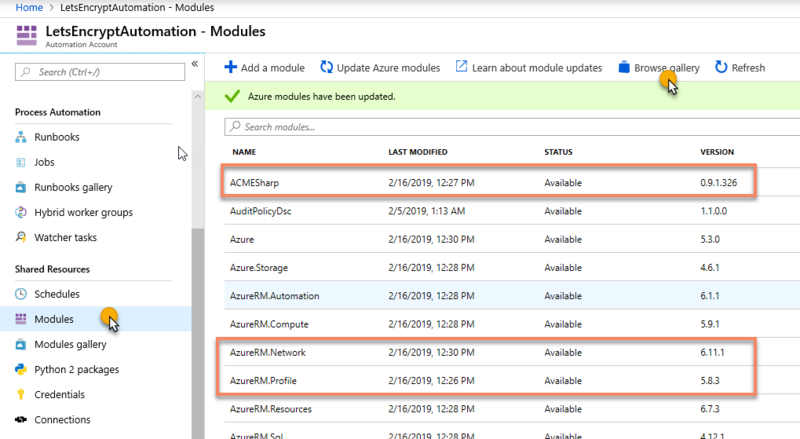 Inside the Automation resource, open the Modules and browse the gallery to import the following modules: 'AzureRM.profile', 'AzureRM.Network' and 'ACMESharp'. 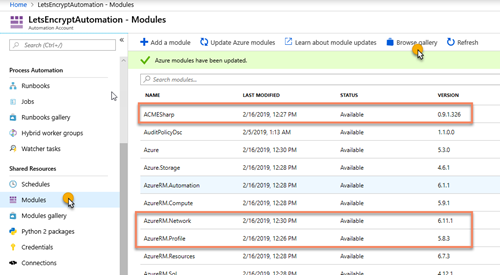 Ensure you import the latest version of all of them and update the current ones already imported (for example, the AzureRM.profile is enabled by default, but we need the latest version available on the gallery). 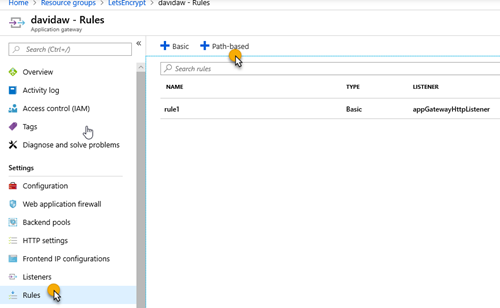 You can test the runbook on the Test pane, and passing the required parameters (domain name, email address used on LetsEncrypt, resource group names, storage account name, application gateway name and the name of the certificate you used when setting up the https listener). 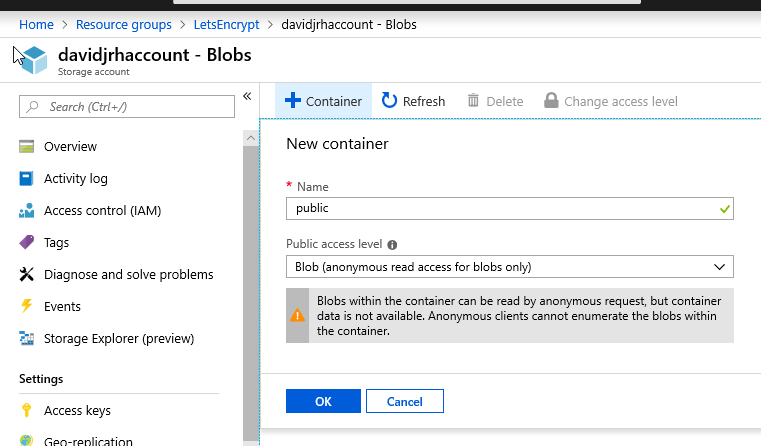 It takes around 15min to complete. When browsing the site again with https, you will notice that the certificate was updated correctly. IMPORTANT: LetsEncrypt has its own weekly limits when issuing certificates for a specific domain in production (50 per week), so be aware when testing the PowerShell script. 6. 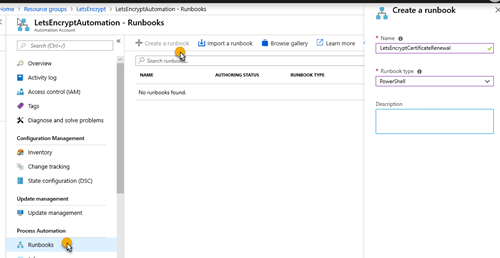 Setup the parameters to schedule the runbook with the schedule you created before. And that’s all. 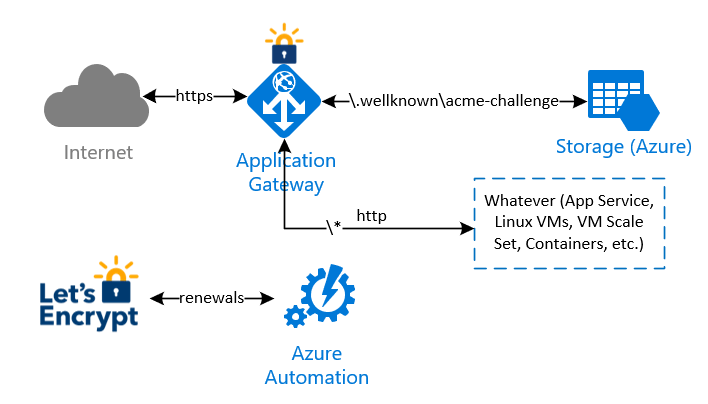 Now you have setup the autorenewals of your Application Gateway SSL certificate with Azure Automation.